What comes to mind when you hear the word ‘immigrant’? For most people, it is a Mexican individual. Rarely do people think of the Dutch that come from the Netherlands. 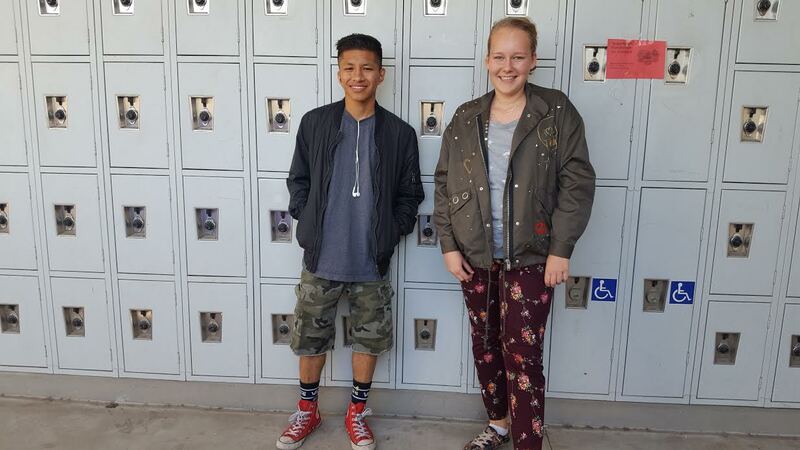 Here at Los Angeles River School, two students give their input into the adversity they have dealt with. Two immigrants, one from Mexico and the other from the Netherlands. Guzman the left, and Merrett on the right at Los Angeles River School. Racial stereotypes are one thing that can not be avoided by any religious, ethnic or cultural group. Although it does seem to be true that certain groups are stereotyped more than others, it can be a negative remark or positive remark but never a hundred percent true. Iver Alejandro Guzman is currently a senior at LARS. He came from Mexico at only six years of age. He works with his family in their local food truck during the weekends while maintaining a 3.0 GPA. In contrast, to Gerritbina Maria Wilhelm or as she prefers to be called, Merrett, is a freshman at LARS who came from the Netherlands only two years ago. Guzman recalls his journey from a car, then foot as he crossed the border. “I was pretty much drugged and the walk was really hot and my thirst was never quenched, [it took] maybe like three to five days,” said Guzman In those days I didn’t have any family members near me except my mom,dad, cousins, and uncle”. Merrett came with only her mother and brother in hopes to reunite with her father who worked in the U.S. and didn’t get to see his children as often as he’d like. Merrett does not regret moving here. “I miss my country, friends, family and missing [other relatives] birthdays, but I love being here because I get to see my dad.” said Merrett. Guzman however came with his mom and dad in search of a better life filled with more opportunities than he would have had in Mexico. “When I was small I always wanted to go back, but now as a teen I see things differently and realize all the opportunities I have here,” said Guzman. Guzman had a different experience when it came to stereotypes. “Sometimes, and more recently, when I turned fifteen, people would not let me into places like Buffalo Wild Wings, Tilly’s and King Taco because they thought I didn’t have money. It made me [feel] inferior but once I showed that I had money it made me feel powerful,” said Guzman. At times, no one notices that they are stereotyping a certain group, but they need to be aware about how that affects someone. “I really like it here and I like the palm trees. It was my first time seeing them and the hills because in the Netherlands, it’s really flat and the weather is better here [in Los Angeles],” said Merrett. Both Merrett and Guzman believe they made the right choice in coming here to the U.S. “In Mexico, people need to obey their parents and what they say but here you have more freedom and you realize the rights you get here [in the U.S],” said Guzman. The U.S is such a diverse country and people from all walks of life come here to experience “The American Dream.” It’s up to us to uphold the mores of our country and its newcomers who come from different places where they don’t have as many opportunity as they would have here. We should not be prejudice towards immigrants, but welcome them.